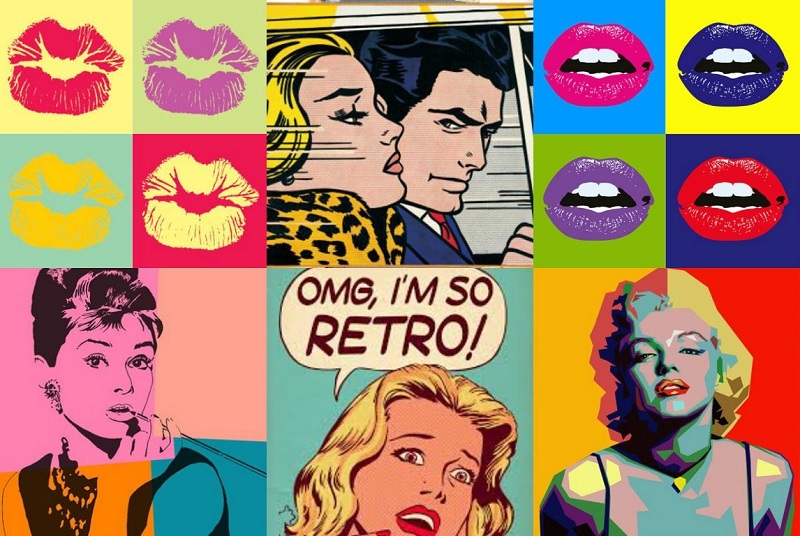 Style pop art is a modern interior style that appeared in the 50s of the last century on the wave of the development of abstract expressionism. 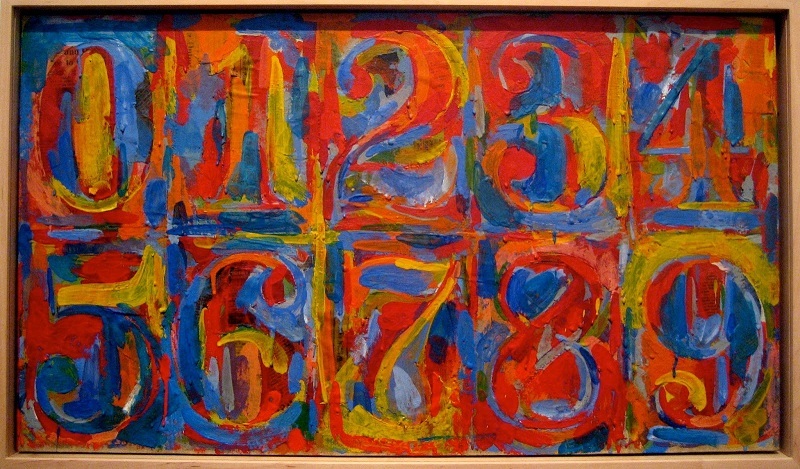 The style combines bright colors, involves the use of inexpensive, but original design elements, as well as a large number of paintings in the style of Andy Warhol. Creation of decor using a variety of shapes, original installations. 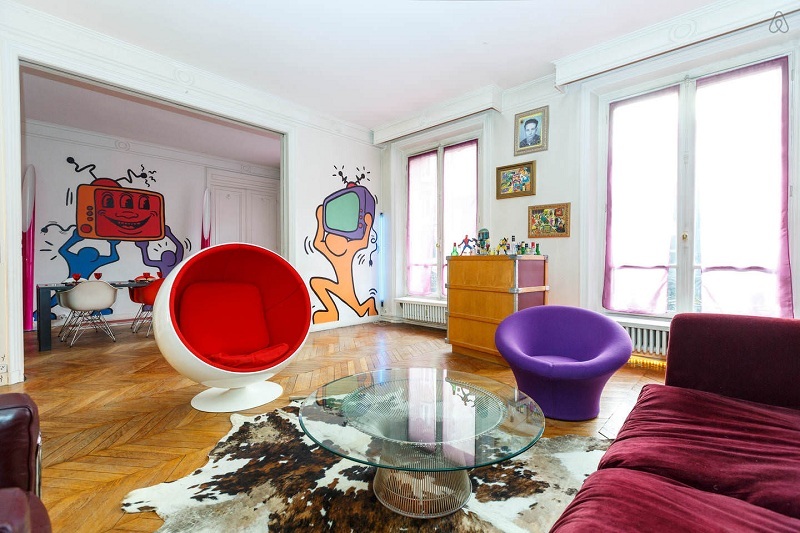 The combination of a riot of colors, paintings allows you to create unusual rooms in which you want not only to relax, but also to have fun, to live life to the fullest. 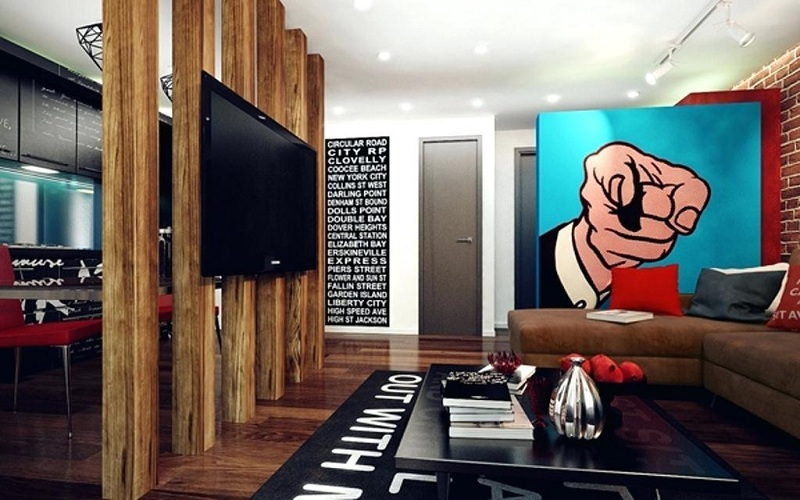 If you are not yet ready to radically change the apartment, you can make an accent wall in the style of pop art. 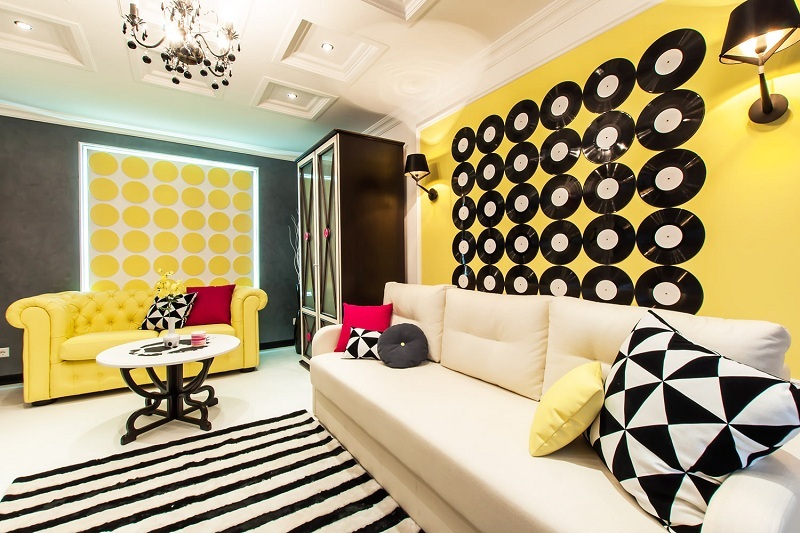 In this case, the room will have a discreet design, which combines 2-4 colors, and one of the walls should be supplemented with an accent painting, drawing, vinyl sticker or plates. Plaster or water-based paint, best suited to create a light monochromatic background. Preferably the use of products from plastic, glass, furniture with lacquered MDF facades, which have an attractive glossy surface. For the floor, it is worth choosing laminate flooring, any types of tiles, but the ceiling can be made tensioned by decorating it with spotlights. A large number of shelves and cabinets. 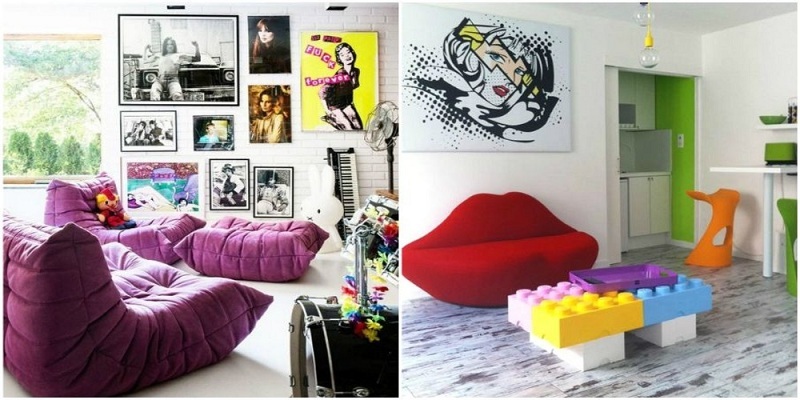 Even if you don’t find something suitable in the collections of the furniture of pop art, you can use rugs that are distinguished by rich color, sofa cushions, bright puffs to make the interior light, to make it more understandable and simple. For rooms in this style is not typically the use of massive furniture made of natural wood, too expensive elements of furniture! The palette of style involves the use of light base colors: white, beige, gray, silver. When creating the design, acidic pink, green, purple, yellow, blue, red and other colors prevailing in the decoration of furniture, accessories, and lamps are used. 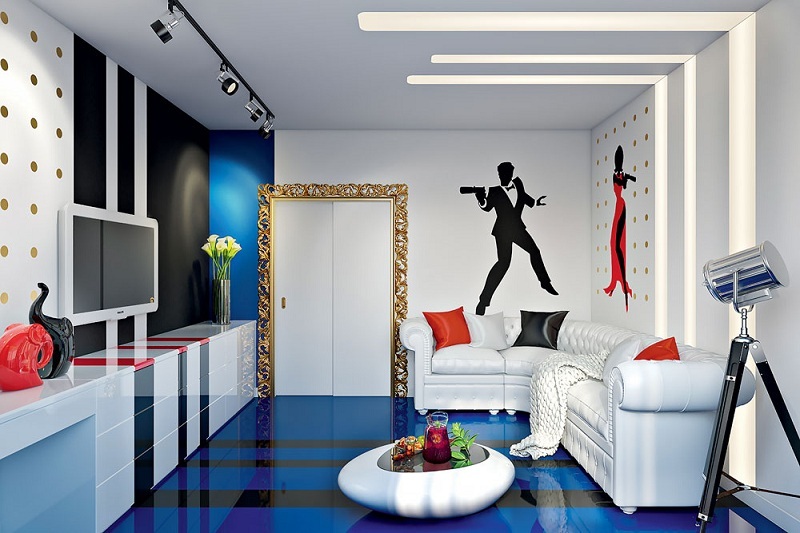 Choosing the design of pop art, it is necessary to find a balance between brightness and restraint: light finish – flashy accessories, otherwise the room will be too emotional, oversaturated. The pictures depict the usual things that the artist presents in a new light. 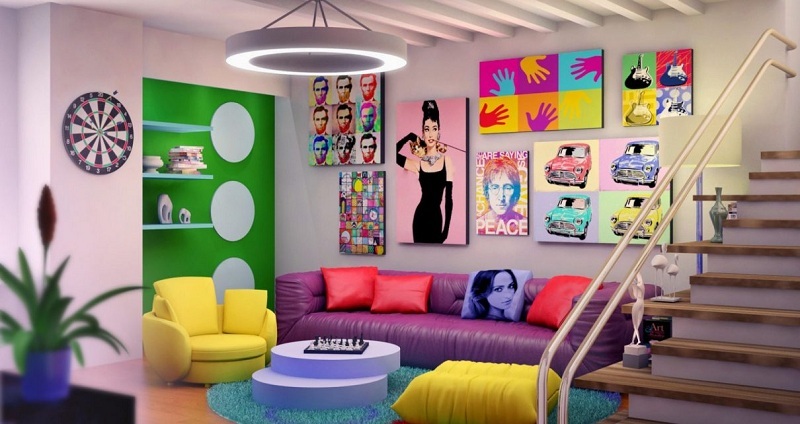 Creating premises in the style of pop art does not require large expenditures or efforts. Paint the walls with white paint, use simple but bright furniture, and decorate the largest wall with a picture of Jasper Johns or David Hockney to achieve authenticity! As for accessories you can use any items, taking into account the recommendations of designers. Put the usual cleaned tin can on the dresser, because it can function as a vase or stand for pens. A stack of newspapers or magazines, located near the chair, turns into a not very practical, but beautiful and original coffee table. 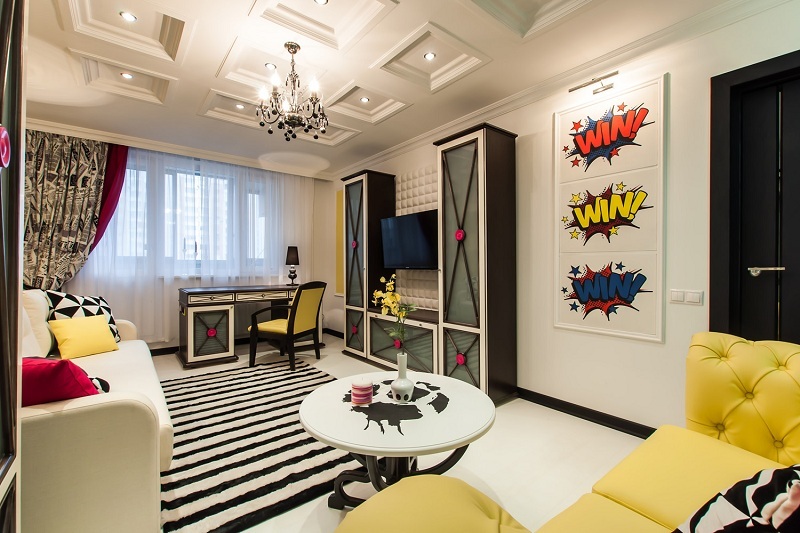 In the rooms, designed in the style of pop art, the windows should let the light in well, therefore it is worth refusing from heavy curtains and curtains. The ideal solution is blinds or reliable blinds that will not prevent daylight from entering the room but will hide apartment owners from prying eyes in the dark. 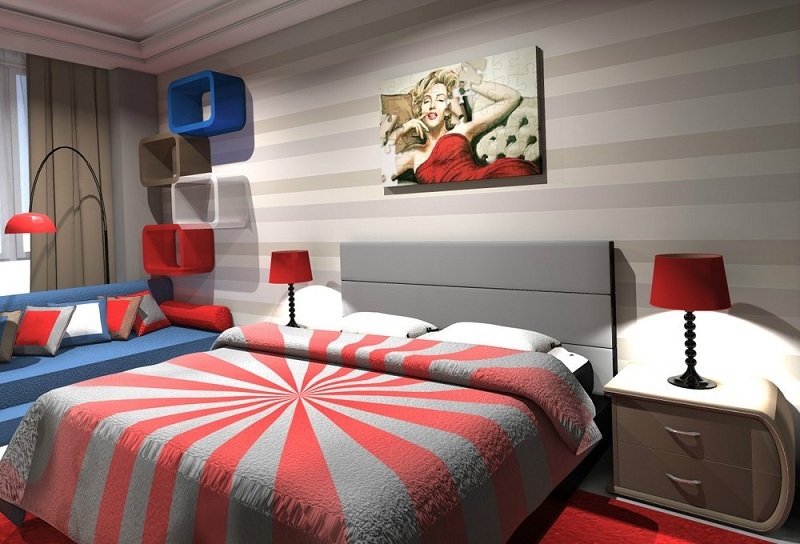 Ceiling and wall lights, neon lights are used as sources of artificial lighting. It will well complement the overall aesthetics of a suspended ceiling with lights and mirrors, as well as glossy surfaces of furniture and accessories that reflect light. 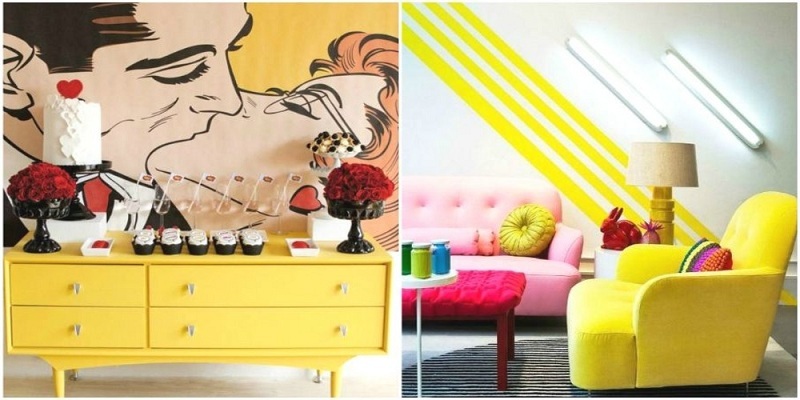 The simplicity bordering on deliberate pompousness, bright colors, and original accessories and furnishing elements made from budget materials are what makes pop art the perfect interior style you can create with your own hands. Connect the imagination, use photos of finished interiors to bring shades of freedom, equality, and good mood into your home!